Beeton’s Book of Household Management, Coloured Plate. Published in 1861, Beeton’s Book of Household Management is perhaps one of the most famous non-fiction books to come out of the 19th century. At over one thousand pages long, it was the first publication of its kind to address all aspects of household management, covering everything from cooking and cleaning to childrearing and animal husbandry. It even includes a section on the law, providing the inquiring housewife with general information on leaseholds, the legal rights and obligations between husband and wife, and the questionable validity of an I.O.U. Beeton’s Book of Household Management Original Title Page, 1861. Recipe for Cowslip Wine from Beeton’s Book of Household Management, 1861. Recipe for Hair Wash from Beeton’s Book of Household Management, 1861. The chapter on Domestic Servants also provides guidelines for the hiring and firing of servants, the writing of a character reference, and the respective wages commonly paid for each position in the household. For those of us who write novels set in the 19th century, this section of the book is invaluable. 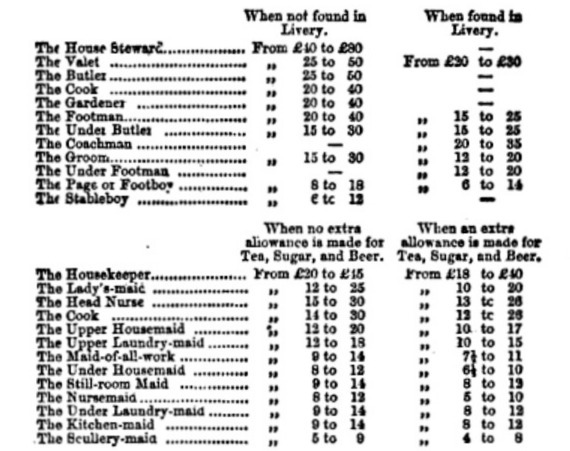 Guidelines for Servant Wages from Beeton’s Book of Household Management, 1861. February 18, 1865 , Illustrated Times , London, England. Beeton’s Book of Household Management has been in continuous print since it was first published in 1861. Now popularly known as Mrs. Beeton’s Book of Household Management, it has remained a perpetual bestseller and can be purchased in its various incarnations from booksellers all over the world (*though being a purist, I advise the original edition which is currently free in the public domain). If you are at all curious about Victorian life, I highly recommend you give it a look. It is much, much more than a mere 19th century cookbook. **Author’s Note: This article was originally published on the English Historical Fiction Authors’ Blog in November. Beeton, Isabella. Ed. Beeton’s Book of Household Management. London: Farrar, Straus, and Giroux, 1861. Beetham, Margaret. Ed. Victorian Women’s Magazines: An Anthology. Manchester: Manchester University Press, 2001. Hartley, Cathy. A Historical Dictionary of British Women. London: Routledge, 2013. Krueger, Christine L. Ed. Encyclopedia of British Writers, 19th and 20th Centuries. New York: Facts on File, 2003. Wagner, John A. Ed. Voices of Victorian England: Contemporary Accounts of Daily Life. Greenwood, 2014. Wagner, Tamara S. Ed. 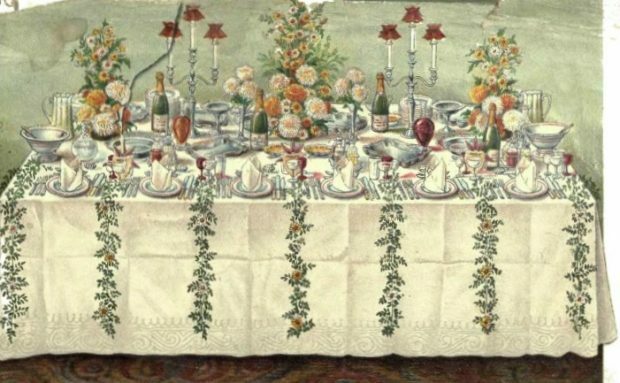 Consuming Culture in the Long Nineteenth Century: Narratives of Consumption, 1700-1900. New York: Rowman & Littlefield, 2010. I am always startled at the mounds of food, colorful desserts, great haunches of meat pictured in these Victorian manuals on housewifery. My own copy (1870s) was being used in a mid-Atlantic household up until the 1940s when it was finally given to my family as a curiosity. Me too, Angelyn. It’s hard to imagine them cooking such elaborate things in a middle-class Victorian kitchen. But then, I’m sure servants did a lot to make up for the lack of modern technology. You’re very welcome :) Glad you liked it! Amazing read. I’m a fan of Victoriana! Loved the post. Thank you. So glad you enjoyed it, Selina :) Thanks for commenting! I’m so glad you enjoy them :) The 19th century was a fascinating time. It’s always nice to escape there once in a while! Your post was very informative, liked reading it very much, thank you for sharing with us. Love, love, love! I adore the 19th century and have studied it quite extensively…nut nowhere near enough. It’s interesting that ax a woman she was allowed to write and publish – likely because she was writing about the “separate sphere” of domesticity which was the goal for women in the newly-created middle class. Very good point! She wrote about acceptable topics for 19th century ladies, fashion, housekeeping, & the like. Her popularity may not have been as great had she wrote on something else. Then again, you never know! A good housewife is an amazing thing to behold. It also may be that it was what women wanted to read. We still have fashion and housekeeping blogs and magazines today and they seem to do pretty well. This reminds me of Martha Stewart’s prison sentence. She took back the “lowly” world of women’s work and elevated it again. I don’t know who hated that more, men or women. She definitely got punished more than a man would for insider trading. Thanks for posting this was a wonderful article, I have a small bookshop here on the island, crossing my fingers the collectors sections has at least one copy of this book! looks like an incredible read. You’re very welcome :) It’s a great read – so much historical information! If you can’t find a hard copy in your bookshop, the link at the end of the article will take you to a free e-copy of the original.